يشكل فندق Brisbane Street Studios بموقعه الممتاز في منطقة الأعمال, مطاعم, تسوق ضمن مدينة بريسبان، مكاناً ملائماً لقضاء العطلة بعيداً عن عجقة أيام العمل. يقع مركز المدينة المثير على بعد 5.5 KM فقط. سوف يعشق النزلاء موقع هذا الفندق، فهو قريب من أهم المعالم السياحية في المدينة كمثل ‪Kurilpa Bridge‬, مستشفى الأميرة الكساندرا, Brisbane Cosmetic Clinic . كما يقدم Brisbane Street Studios الكثير من الخدمات لإغناء رحلتك في بريسبان. يمكن للنزلاء الاستمتاع بالميزات التالية: واي فاي مجاني في جميع الغرف, متجر, خدمة سيارات الأجرة, مجهز لذوي الإحتياجات الخاصة, مطبخ أثناء إقامتهم في هذا المكان الرائع. تتضمن كل غرف النزلاء وسائل الراحة والتسلية المصممة خصيصاً لضمان الراحة القصوى للضيوف. صممت خدمات الاستجمام في الفندق والتي تتضمن مركز للياقة البدنية, مسار جولف - ضمن 3 كم, حديقة لمساعدتك على الاسترخاء والراحة. إن Brisbane Street Studios هو خيار ذكي بالنسبة للمسافرين إلى بريسبان، بما يوفره من إقامة هادئة ومرحة. يرجى العلم أن ساعات العمل هي من الاثنين إلى الجمعة من 9 صباحًا إلى 5 مساءً والسبت والأحد من 10 صباحًا إلى 3 عصرًا. إذا كان النزلاء سيصلون في غير هذه الساعات، فيرجى الإبلاغ بموعد تسجيل الوصول التقريبي عند الحجز حتى يمكن ترتيب تسجيل الوصول بعد ساعات العمل تبعًا لذلك. يُرجى العلم بأنه يجب على النزلاء الإعلام بالموعد التقريبي لتسجيل وصولهم عند الحجز. Thank you for your review. We are pleased that you have enjoyed our location. Most of our double rooms are located away from the main road. Your daughter had specifically requested that room as she thought you woud be most comfortable in it due to its size and offering. We are sorry you did not enjoy it as much as anticipated. We do hope to see you back soon. We have noted your preference for a room at the other end of the property. Our aim is to make our guests happy and have the most comfortable stay. The kitchenette is just so awesome, we were able to whip up delicious meals throughout our stay. Rooms and bed were clean and very comfortable to stay in. The biggest problem would be the thin wall that the rooms were built on. It was not able to keep the coldness from the outside, and we could hear whatever noise or sound made from the next door. Thank you for your positive review of our hotel. We are happy you have enjoyed our rooms and kitchens. We are sorry you were cold in your room. Every studio is fitted with a reverse air-conditioner. We would have been more than delighted to show you how to keep the room warm. We apologise for your noisy neighbours as it is unusual for our guests to hear the guests next door. We answer the phone 24/7 and are always happy to sort out whatever issue our guests may encounter. Nice tidy little unit in a good location for what I needed to access. Staff were very friendly and helpful. Great, comfy, clean rooms. Only downside is the front rooms are noisy from the traffic but earplugs were provided. All in all great location. Location, parking and washing machine. We selected this hotel based on location as it was very near the Princess Alexandria Hospital complex. It is also very near some basic grocery suppliers like Target and Woolsworth. Although parking was available, note that they only service the rooms ONCE A WEEK! Our understanding of most of the serviced apartments/hotels worldwide, is daily room service-especially for a 7-day stay. We stayed in a room with a tinge of urinal smell and although we notified the management, it was not resolved even till the day we left. Very dissappointed. At the room charges we were paying, I am sure they can do better. 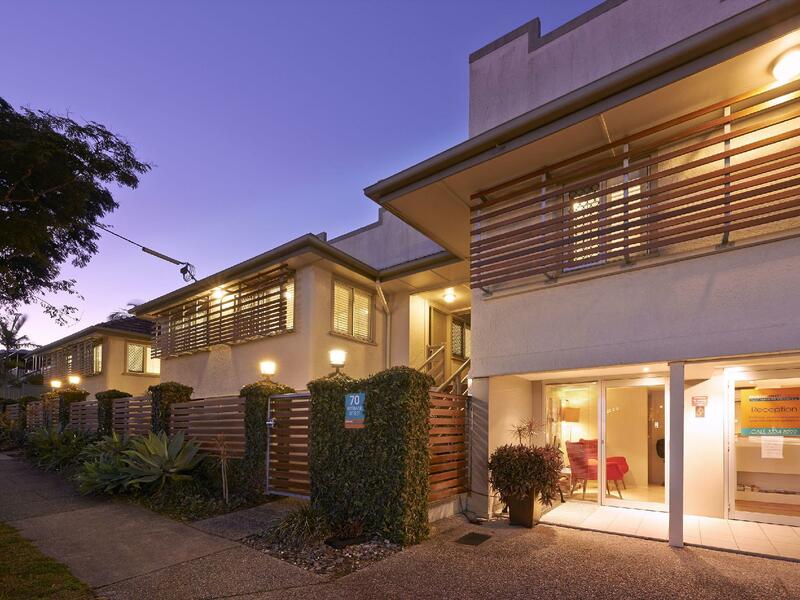 It was located in a good location with buranda village nearby. Able to get shopping done in woolies and target. Was pretty clean with everything required. Quiet, comfort and nice food around the area. Please take note, this is my 3rd time to submit my review. Same as my Nagaworld Hotel, already submitted long ago. I was surprise I need to inform the staff that I need to clean the room! This is also my 1st time come across this practice. I would like to recommend, must try one of the cheese cake shop opposite the hotel. Should try 'Red Win Steak' from Mr Steak café. Nice quiet peaceful place. peaceful, near supermarket and good food shop. This is the 1st time I come across that I need to contact the staff to clear my room. I stay till 3rd day then I look at the note file on the table then I realise that. Is this the practice? Overall the stay was relax and peaceful. No food/dinning at the studios, so no comment. Complete with everything including washing machine, microwave, stove, free wifi and not too far from the city. Reasonable price for Brisbane one night rentals . was amazed at the asking prices for hotels and found the b.s.s. rates reasonable. newly re-decorated and very clean and compact. reception staff very helpful and gave several suggestions for the area. we were attending a funcion at south bank and found access easy, as was our journey out the next day to the gold coast. close to woolie, easy to park, room a little bit small, but confort. next to a busy road, not quiet at night..
Well equiped, new and very clean. Not exactly in the center though not far. We enjoyed the night we spent there. It is definitively a good address in Brisbane. The only difficulty we had was getting there. Traveling without a GPS, it would have been very helpful to know in advance that the study is just behind the PA Hospital.